The shape and size of the house has been, partly, revealed again as most of the scaffolding round the outside has been taken down. On the south side, in particular, there’s more light in the house and the house, from the outside, looks smaller. Some of it has been put up again inside, so that it’s easier to put up the plasterboard into the top of the internal ridge. Details. It’s very difficult to plaster into an acute angle, such at the top of the building where the sloping ceiling meets the ridge beam. 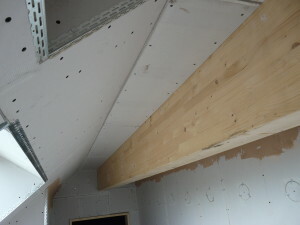 So when the insulation has been put in, battens to support plasterboard need to be fitted so that the ceiling is squared off for few inches and can meet the beam at a right angle.